On our product page, we explained the importance of real wood mouldings, mount boards and the type of glass and glazing when framing your treasured moments and works of art. What are you looking to frame? The first thing to consider is what you are framing. Is it a photograph, a beautiful piece of art, an autograph, a football jersey, your child’s first painting? What is your personal connection to the item – is it a picture of your wedding day, the handprints of your first born child, the landscape of your favorite place, a piece of memorabilia that you are proud to own? Is it a neutral piece that you want to add colour and personality to or is it bursting with colours that you want to somehow tone down? Do you want the item to create an atmosphere in the room it will be placed or do you want it to have a subtle presence? Where will you display the item? Will it be placed in all its pride and joy above the fireplace or will it be added to the rest of the family photos along the staircase? Is the room filled with sunlight? This will determine the type of glass or glazing to be used. What type of deco and colour schemes are in use in the room? 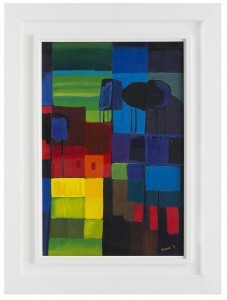 Or maybe the frame is destined for an art gallery or in the main board room of your office? What impact do you want to make? Do you want to make a big statement with small artwork or do you want to tone down a vibrant piece of art? The statement you want to make will also play a role in determining the size, depth and colour of the frame and the borders, for example. What is the purpose and lifespan of the item you are framing? Make sure you select the right materials to match the environment in which your picture/artwork will live in. If you are framing an original piece of art or a treasured memory that you want to hold on to for a lifetime, make sure to talk to us about our range of mount boards and sealing that will protect your item from being damage by dust, moisture, insects. Do you need guidance and inspiration? This is your treasured picture or piece of art so trust your own style preferences and personal tastes. However, if you are unsure or need some guidance in determining which frame will best fit your item, its surroundings and purpose, drop into our store in Blessington to talk to a member of our team and to see some framed items on display.